include a tube of toothpaste, a car, or an orange. A service is a task or activity performed for a customer. For example, the dental hygienist who cleans your teeth provides a service. 7. Cost is the amount of cash or cash equivalent sacrificed for goods and/or services that are expected to bring a current or future benefit to the organization. An expense is an expired cost; the benefit has been used up. 8. A period cost is one that is expensed immediately, rather than being inventoried like a product cost. 9. Allocation means that an indirect cost is assigned to a cost object using a reasonable and convenient method. Since no causal relationship exists, allocating indirect costs is based on convenience or some assumed linkage. 10. The percentage column on the income statement gives some insight into the relative spending on the various expense categories. These percentages can then be compared with those of other firms in the same industry to see if the company’s spending appears to be in line or out of line with the experiences of its competitors. Copyright © 2018 by Nelson Education Ltd.
are no beginning or ending inventories in a service organization. 14. Selling costs are the costs of selling and delivering products and services. Examples include free samples, advertising, sponsorship of sporting events, commissions on sales, and the depreciation on delivery trucks (such as Coca-Cola trucks). for the units produced (completed) during a time period. The cost of goods sold is the cost of direct materials, direct labour, and overhead for the units sold during a time period. The number of units produced is not necessarily equal to the number of units sold during a period. For example, a company may produce 1,000 pairs of jeans in a month but sell only 900 pairs. Copyright ÂŠ 2018 by Nelson Education Ltd.
*Steps in calculating the percentages (the percentages are rounded): 1. 100% of sales revenue) 2. 2. Lauren and Elizabeth are paid more salary than Peter because they have less opportunity to earn commission since they do not spend 100% of their time selling. *Note that commission is completely a selling expense; it is not allocated between selling and administrative expense. Total period cost = $193,500 + $322,500 = $516,000 $724,950 Unit product cost = = $24.165 30,000 Costs directly associated with the manufacturing process are part of product costs. All other costs are treated as period costs. The full cost of $910 per unit would be used in pricing decisions for the product to ensure that all costs of operating the business were covered. *See solution to Exercise 2–18. Cost of goods sold is different from cost of goods manufactured because cost of goods sold is determined after taking both beginning and ending finished goods inventory into account. *280,000 x $12 = $3,360,000 A manager can use the percentage information to determine where adjustments can be made to the cost of operating the business. It would appear that administrative expenses are the highest expense item and therefore should be closely examined. *37.5% x $62,500,000 = $23,437,500 **$3,250,000/(1 – .24) ***($23,437,500 – 4,276,316)/3 It is useful to calculate the percentage of each cost as a percentage of sales to allow identification of trends within the company, to allow comparison to other different size companies, or to compare to industry statistics. the fries. They are direct materials but could also be classified as overhead because of cost and convenience. Direct labour consists of the part-time employees who cook food and fill orders. Manufacturing overhead consists of all indirect costs associated with the production process. These are utilities, the rent for the building, the depreciation on the equipment and fixtures, and the cost of janitorial wages and supplies. Selling and administrative expense includes Andrew Gallant’s salary, advertising, accounting fees, and taxes. 2. Elena’s simplifying assumptions were: (1) all part-time employees are production workers, (2) Andrew Gallant’s salary is for selling and administrative functions, (3) all building-related expense as well as depreciation on cooking equipment and fixtures are for production, and (4) all taxes are administrative expense. These make it easy to classify 100% of each expense as product cost or selling and administrative cost. The result is that she does not have to perform studies of the time spent by each employee on producing versus selling burger bags. In addition, it is likely that Andrew Gallant pitches in to help fry burgers or assemble burger bags when things get hectic. Of course, during those times, he is engaged in production—not selling or administration. The cost of determining just exactly how many minutes of each employee’s day is spent in production versus selling is probably not worth it. (Remember, accountants charge by the number of hours spent—the more time Elena spends separating costs into categories, the higher her fees.) For this small business, there is little problem with misclassifying these expenses. The net income would be identical, although the gross margin would differ. Pop’s Drive-Thru Burger Haven is not a publicly traded company, and its income statements do not have to conform to GAAP. Outside use of the statements is confined to government taxing authorities and a bank (if a loan or line of credit is necessary). Elena’s accounting works well for those purposes. If cost is $150 per stick and gross margin is 40%, selling price must be 150/0.60 = $250. No, we do not need to prepare a statement of cost of goods manufactured because there were no beginning or ending inventories of work in process or finished goods. As a result, total manufacturing cost is equal to the cost of goods manufactured which is equal to the cost of goods sold. 3.
c. These costs include direct materials, direct labour, and manufacturing overhead. The total of these three types of costs equals product cost. a. If Linda returns to school, she will need to quit her job. The lost salary is the opportunity cost of returning to school. b. If Randy were engaged in manufacturing a product, his salary would be a product cost. Instead, the product has already been manufactured. It is in the finished goods warehouse waiting to be sold. This is a period cost. d. The design engineer is estimating the total number of labour hours required to complete the manufacturing of a product. This total will be used to compute direct labour cost. f. The cost of converting direct materials into finished product is the sum of direct labour and manufacturing overhead. This is conversion cost. 10. e. The depreciation on the delivery trucks is part of selling cost, the cost of selling and delivering product. Conceptual Connection: There are different definitions of cost because they are used for many different purposes and the purpose will determine how we must define costs. The dominant cost in the cost of services sold is direct labour. This cost is often the largest cost in a service company, especially when what is sold is professional time and expertise. Law and accounting firms also would show direct labour as the largest cost in the cost of services. It is possible for a service firm to show manufacturing overhead as the largest cost. For example, a free-standing radiology clinic may have overhead as the dominant cost, since the depreciation on equipment (e.g., x-ray machines, MRIs) would be very high. Berry Company prepares custom building plans to order. That is, Berry does not start to design a project until a client contracts with it to do so. If Berry began to prepare plans on speculation, it would design the building first and then have a stock of finished plans ready to sell. In that case, there could well be an inventory of finished plans. *Direct materials used = $46,800 + $320,000 – $66,800 = $300,000 2. 3. The Internet payment of $40 is an expense that would appear on the income statement. This is because the Internet services are used up each month— Luisa cannot “save” any unused Internet time for the next month. The opportunity cost is the $100 that Luisa would have made if she had been able to accept the movie role. It is an opportunity cost because it is the cost of the next best alternative to dog walking. *Production is 20 units per printing hour for magazines and 100 units per 5,000 printing hour for brochures, yielding monthly machine hours of 350 ( + 20 10,000 ). This is also monthly labour hours as machine labour only operates 100 the presses. *Rent and insurance cannot be traced to each product so the costs are assigned $1,540 using direct labour hours: = $4.40 per direct labour hour. The other 350 DLH overhead costs are traced according to their usage. Depreciation and power are assigned by using machine hours (250 for magazines and 100 for $40,000 $350 brochures): = $1 per machine hour for power and = $2 per 20,000 350 machine hour for depreciation. Setups are assigned according to the time required. Since magazines use twice as much time, they receive twice the cost: Letting X = the proportion of setup time used for brochures, 2X + X = 1 implies a cost assignment ratio of 2/3 for magazines and 1/3 for brochures. A case could be made for assigning part of his salary to production. However, since he is responsible for coordinating and managing all business functions, an administrative classification is more convincing. The costs of the tent sales are accounted for as selling expense. The tent sales are designed to sell products and promote brand awareness. In fact, the most important objective is simply to increase awareness of the Stampede brand. As a result, these related costs are selling expense. The tent sales affect revenue and selling expense on the income statement of Stampede. A couple of actions could be taken. First, it could look for a more appropriate venue. The outer parking lot of a shopping centre, or even a large grocery store, would enable Stampede employees to easily load purchased product into customers’ cars. Second, the deejay could be dispensed with; instead, music could be played from CDs over an audio system in the tent. Third, Stampede could spend a year or so raising brand awareness in the Edmonton market before attempting another tent sale. *Direct materials used = $2,685 + $36,699 – $2,992 = $36,392 2. The firm needs a profit of $500,000 to meet needs of the partners ($125,000 each), so income must increase by $390,000. Revenue must be equal to $2,250,000 on an annual basis. Billing must be based on more than three times the salaries of the partners. If billing was based on four times the salaries of the partners, then revenues would more than cover the costs and leave enough profit for profit sharing. The reason that the other firm’s formula does not work is that the indirect costs of Healy & Sons are proportionately greater. If each partner is going to earn an additional $175,000 through profit sharing, then their share of the profits must be $350,000 split two ways. If the two salaried lawyers share 20% of the profits then the partners’ share is equal to 80%. Profits must, therefore, be equal to $437,500 (= $350,000/0.8). If total costs, before profit sharing, are $1,182,500 and profits are $437,500, then revenues must be $1,620,000. 2. To generate revenue of $1,620,000 at an average rate of $250 per hour, the firm must bill a total of 6,480 billable hours or an average of 1,620 billable hours per lawyer. 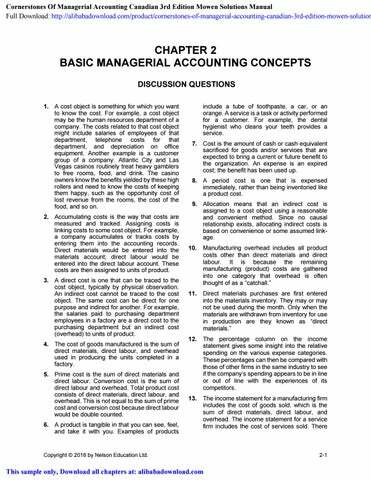 Professional Examination Problem 2â&#x20AC;&#x201C;37 1. d.
(1) direct cost (2) fixed cost. 2. a. The cost, in total, does not change with changes in the volume of the cost driver. 3. a. Yes, it makes sense for Peter to quit his job and open his own shop. Profits will be positive under each alternative and this is after he takes a salary of $100,000 per year. Peter should choose the high-end mufflers as they will generate a greater profit. Case 2–40 Freddie is in a very difficult position. He should not accept the inducement being offered by Sydney to influence his decision. But it does not end there. Freddie should remove himself from the decision making on the project so that there will be no perceived conflict of interest in judging submissions that contain one from a good friend. He should also report to the mayor the fact that he was approached to accept an inducement by one of the bidders. He may want to do it on a no-names basis initially to see what the reaction is. If the mayor wants to exclude the bidder from the competition, he will have to disclose it. If the mayor is simply happy that Freddie did not accept the inducement, then he may not have to disclose Sydney’s name. Freddie should also ask himself whether he should report Sydney to the professional body of architects, as Sydney would appear to be in contravention of their code of conduct. Problem 2-33 Name: Instructor Enter the appropriate amount in the shaded cells. An asterisk (*) will appear in the column to the right of an incorrect amount. 1. Exercise 2-18 Name: Instructor Enter the appropriate amount in the shaded cells. Use brackets for any amounts to be subtracted. An asterisk (*) will appear in the column to the right of an incorrect amount. 1. Problem 2-26 Name: Instructor Enter the appropriate amount in the shaded cells. An asterisk (*) will appear in the column to the right of an incorrect amount. 1.